Chester croquet club began the season with a successful taster day on Sunday 8th April, attended by 16 people who learnt all about croquet. Thirteen of these signed up for the beginners courses which take place in the next few weeks. On Saturday 14th April Chester held its first match of the season at home against Bowdon in the North West golf handicap league. The weather was lovely at last, and it was an excellent day’s croquet with Bowdon winning 11-7. The team was captained by Chris Thomas, with Janet Jackson, Mel Hagan and Jill Foley. Over the weekend two Chester players, John Dawson and Jerry Guest, took part in the North West Millennium Advanced Tournament held at Bowdon. 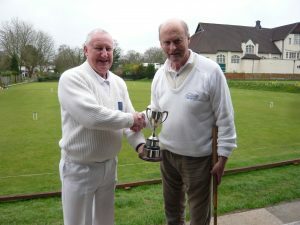 Jerry won all five of his games to secure the B section trophy. Former Chester player, James Hawkins, took second in the A section.